So we sat down as a family and watched The Current. Wow. The basic story is that Jake is a Chicago teen who likes his friends, loves the Cubs, and has life figured out. But then... his parents decide that there is just too much violence in their neighborhood, they buy a campground in Northern Minnesota, and move the family there. Jake is far from pleased. 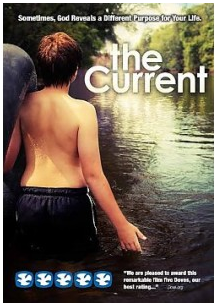 He makes friends with a boy from across the river, and that friendship changes his life. Jake is going to be incapable of figuring out how to do anything, and the local people are going to have to teach him how to use an outdoor restroom, how to start a fire, how to empty an outdoor trash can, etc. The local people are going to be incompetent country bumpkins, and Jake is going to teach them a thing or two about the real world. Happily, neither scenario played out. Jake was an obnoxious, self-centered teen at the start of the movie, but he certainly is capable of doing basic chores. We loved this movie. Everyone from the 8 and 10 year olds, to the teen boys (ages 13, 15, and 17), to Mom and Dad. Very family friendly, with some very good messages. One thing that my oldest really loved was how there was just a hint of boy-girl stuff going on, like a conversation about kissing a girl (on the lips!?!) between the two friends, a couple mentions of some girls being "hot," and some clear showing off to get the attention of those hot girls. But nothing really comes of it. There aren't any real kisses, and no implied relationships, even in the 15 years later scene. One thing my husband and I appreciated was that unlike some other movies that take place near our homes, this one clearly involved people who live there and actually know the culture. No exaggerated stereotypes, and casual mentions of "The Cities" (which is Minneapolis and St. Paul, for all my non-upper midwest readers). I have a copy of this movie to give away, and I do highly recommend it. Family Christian Stores provided me with this DVD and the one I'm giving away. I have been to Minnesota but never camping there, we always go to the Mall of America! It is always such a lovely drive through there though! I have gone camping, but never in Minnesota. Would love to go and visit one day. I have not ever been to Minnesota. We do love to camp though! I want to see the lessons in the movie. I have two teens who seem to think they know everything. I'm sure we could all learn from this movie. Driven thru Minnesota once but it was snowing so not too much to see. Not a big camper (husband just recently got on board to the idea of camping but we have yet to do it) but I've always thought it would be awesome to either own a campground or a B&B.